Has this been discussed? 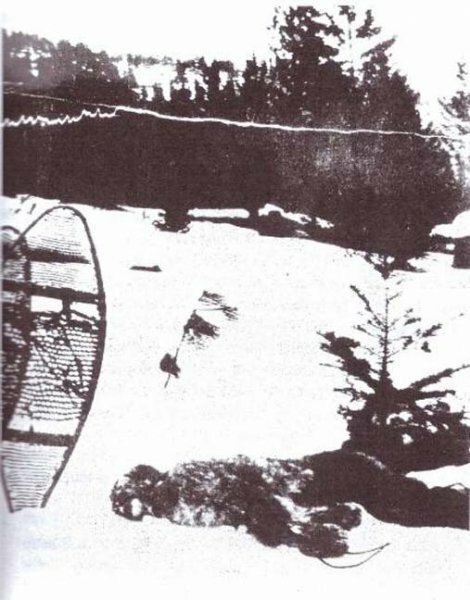 Apparently an 1894 photo of a dead Bigfoot? The first suspicious detail is the existence of a glass plate photo in the first place. Given the year of the purported photo, it would have been a "dry" plate technology...an improvement over the earlier "wet" plate process (Think: Brady and Gardner c. 1860 American Civil War). Although the dry plate method required a much simpler method of preparing the glass plate "film", as compared to the wet process, the cameras were still large format and were large, heavy and required bulky and heavy tripods to hold a camera that still required long-ish exposure times. All this by way of saying it seems unlikely this equipment would have been present in the remote BC wilderness in the late 19th century. 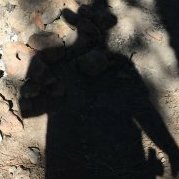 Another suspicious detail? The poor quality of the image. Silver gelatin dry plates take remarkably detailed and crisp photographs. This photo seems to have been deliberately manipulated to give an impression of age, or to disguise details. The shape of the snowshoes are what is typically known as the "Huron" (a/k/a "Michigan) teardrop style. Styles of snowshoes are very particular to certain geographic areas, terrain and typical snow conditions. Somebody with knowledge of the style preferred in B.C. during the alleged time of the photo could probably offer an opinion on that. 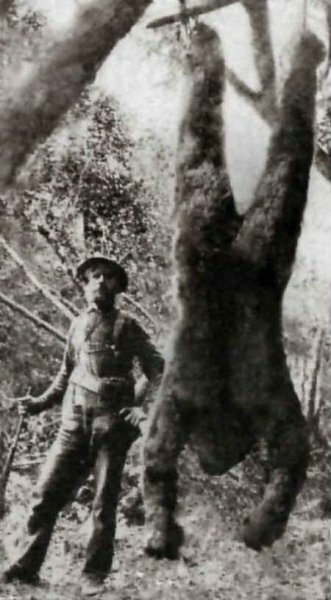 I remember seeing this photo in the Bord's Bigfoot Casebook as a kid. I think it's most likely a mountain lion. The head and front legs look like a big cat to me. I'll admit that the rear leg(s) look a bit odd, though. The linked article makes too much of the writing on the back of the photo, in my opinion. YMMV. Looks like a staged Ivan Marx pic. Or maybe a poor schmuck drank too much and fell face first into the snow. I go with comparing the apparent size of the 'creature' with the approximate foot/boot size that the snowshoe somewhat demonstrates. So not a big creature by any means. Pretty skinny looking in fact. Doesn't look like it could weigh more than maybe 80 lbs. if it is one animal. Could be a pile of two or more? Maybe something or some things a trapper brought in? This was my initial thought as well. It looks like a mountain lion. The legs do not at all look like Mt. Lion. The back story sure seems legit. I will go with poacher in fur suite or malnourished Juvi BF. It looks off to be a mountain lion but I sure don’t see it as being BF related. One way or another I believe hoax if it’s being reported as BF. I see old remake photos often. So ... we're back to the Patterson-Gimlin film? In the first one I see a large dead dog of an unknown breed similar to a sheepdog. Given the lack of detail in the lower right hand corner (can't see any details on the small pine tree either), it might just be an artifact of limited technology or deterioration of an old photo. I always found the Zack Hamilton photo(s) interestin', an probably the oldest possible photo. D i c k Russell, assistant manager at Brooks Cameras, told the Chronicle the pictures were brought in more than 5 years previously(to 1965) by a grizzled woodsman who gave his name as Zack Hamilton and told of being stalked by a hairy monster in the The Three Sisters Wilderness area of central Oregon. He never went back for his films. Thanks for sharing. All of you. I have seen all of these except the first one. Norse. One looks like James Fay holding a mask. The one hanging up looks pretty good. Pat I have seen the photo, but never heard the back story. Thanks once again for teaching me something new. Just another interesting, but unverifiable pic. That Biscardi is involved puts a lot of doubt in my mind though.